There's always someone on your gift list that either has everything, or is a boring sole and has no interest in anything. Those kinda people love to make our lives hell around Christmas time. Up until a few years ago, I used to go hunting round the shops in order for that perfect present, however the last couple of years, I've got a little lazy and settled for the old gift voucher trick. Yes its perfect for them because they can get what they want, and not what YOU want them to have. Its the safe option for the buyer. However lets be honest, for the recipient, it takes the excitement out of things. For the last few years, it has almost become tradition for my boyfriend to get me a £50 gift voucher for Boots to go towards my present. Although I use boots for all my make-up, it did become quite tiresome receiving this after a couple of years. I'm just lucky there were other gifts to go with it! I've been thinking about couples that live together, who have a gorgeous home, all the latest gizmos and gadgets one could wish for, buying something a little more personal (i.e. jewellery or clothes) maybe a little risky. What else could you possibly buy? 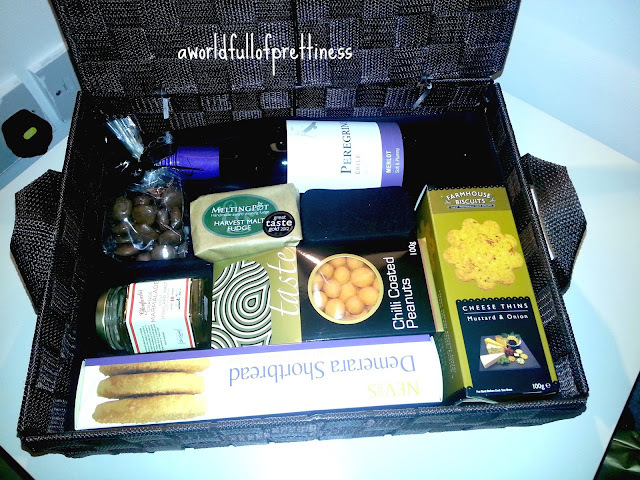 A hamper of course! I personally have never bought anyone a hamper before, but I've been eyeing several up on my travels since Christmas shopping, and there really are lots to choose from to suit all needs. I think its the perfect gift to share - a bottle of wine over Christmas, and some luxury sweet and savoury sweets that aren't normally purchased throughout the year, which makes it even more special. And even when the hamper is finished, pick the right one and you're left with a gorgeous wicker basket, ready to pop a picnic in come the summer! I was lucky enough to win a Christmas hamper through an advent competition on facebook, so I thought I'd share it with you. The box isn't my ideal one (I would have gone for the traditional wicker basket with buckle straps, but we can't pick and choose our winnings unfortunately!). I'm sure I'll find some use for it though! Bottle a Merlot Wine 'Aromas of cherries, pepper and cacao. It is an elegant and full-bodied wine, with hints of chocolate and spice. This specific hamper retails for £31.21. All foods were hand selected and 'sourced from 'local and international suppliers'. What I love about this hamper is how some of the products packaging feel like they've come from a proper traditional handmade farm shop. I've had a sneak bite of the fudge and although I'm not one to buy fudge often, this is absolutely divine. The quality is amazing and it really is a 'melt in your mouth' moment. The cheese thins are more of an oat biscuit which instantly crumbles in your mouth. The flavor is not apparent for the first few seconds but soon kicks in to leave a gorgeous taste. The chocolate caramels aren't what I thought, but better than my expectations! I'm not a fan of marmalade in general (I haven't tried it in years so I may well just have to test my tastebuds again to see if they've altered with age now I have this cute little jar! I will have to say though - Im intrigued with the fact that it has malt whisky in it!). The wine - the one thing people will probably pop open first - I'm not a huge alcohol drinker, in fact I barely drink at all, and I'm assuming this is red wine, something that I never normally opt for, but again, I'm willing to give it a go! The shortbread looks and sounds delish - its not often you'll hear me complain about my shortbread! This hamper can be purchased from Spicers of Hythe, which are based in Kent. 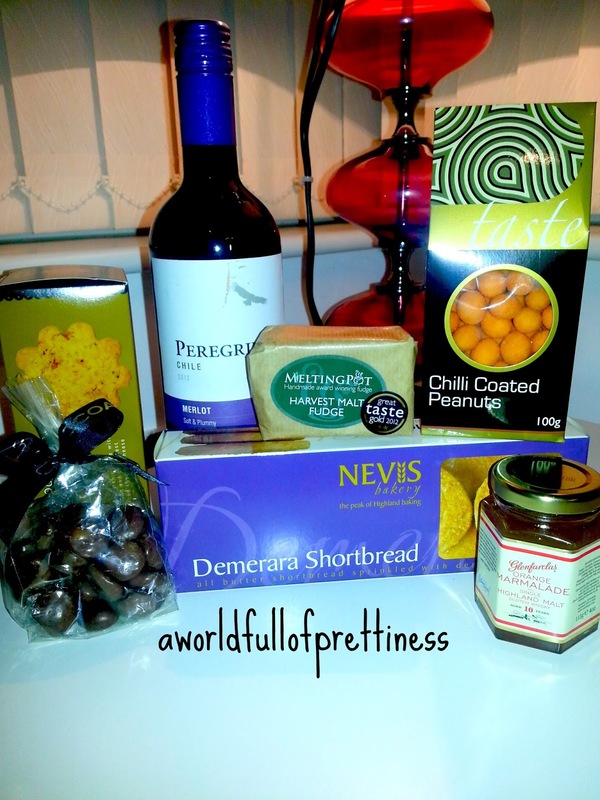 They do a huge selection of hampers, from chocolate to wine, to cheese and family hampers. They make hampers for all occasions and all appear reasonably priced. So, if you're still pulling your hair out with what to buy 'that couple' - or maybe even your Nanna & Grandad, a hamper is the perfect treat. You're probably too late to purchase online now but a mad rush to the shops maybe in order instead!